I love it when I stumble across a toy that my children love to play with, and yet they don't even realize they are learning at the same time! Inchimals has been one of those toys. 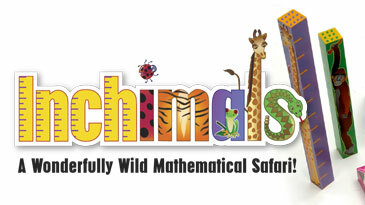 While some might say these are just another set of wooden blocks, Inchimals is a mathematical safari! Included in Inchimals are 12 blocks, starting at 1 inch and going on up to 12 inches. Every block is a different animal, and on the side are lines to count the inches. 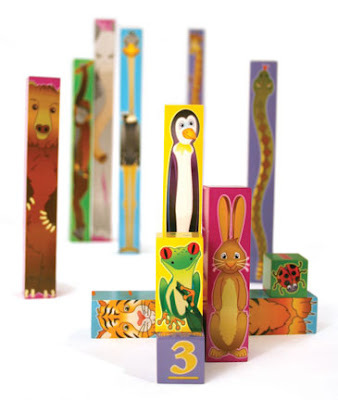 Perfect for your child to learn how to count, and also grasp the concept of inches! A book is included with 100 write on/wipe off math puzzles. You may be wondering "they are really cute, but will my child play with them?" I had the same question. When Fat Brain Toys sent them to me to review, my children were elated. My four year old and 2 year old played with them all afternoon. I sat down and did some of the math problems with my four year old from the book, and helped him write the numbers. Then I showed them both how to line the blocks up in a row from 1-12, making steps. They were so excited! I love how it is introducing math to them, in a fun way! I think the best age is from 3-6 for these blocks. Fat Brain Toys also sent me their catalog to look through, and they sell lots of other really great educational toys! I loved the selection of different building block sets they have. If you are shopping around for some new educational toys, definitely look at their website! You can buy Inchimals for $29.99 from Fat Brian Toys. Fat Brain Toys is giving away a set of Inchimals! To enter, go to Fat Brain Toys website and tell me one other toy that looks interesting to you! This giveaway will end Friday, September 3 at midnight, and a winner will be posted the following morning.We will notify the winners and they will have 36 hours to respond! Open to US Only. This was not a paid post and my honest opinions were used. The opinions are solely my own. Thank you to Fat Brain Toys who supplied the product for the review and giveaway.